We are a 21st-century Christian community whose roots sink deep into 18th-century America and whose aspirations reach into the unknown of the future. 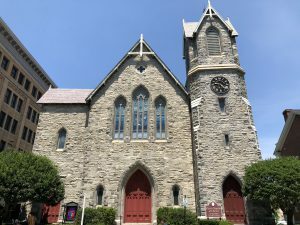 Settled in 1752, First Church of Christ in Pittsfield is both a cornerstone in downtown Pittsfield and a beacon in the city’s emergence as a multi-cultural, multi-ethnic urban center. Some of us are lifelong Congregationalists, others are from different Protestant traditions, and a few are former Roman Catholics. We have come together to walk together. We see our faith as a journey, a quest, which requires the companionship of others. We try, as best we can, to provide that to each other. We welcome all: believers, doubters, those who are skeptical and those who are sure. We welcome all no matter who they choose to love. we welcome all beyond the definitions of gender, race, culture and class. Finally, we are in and, mostly, from the Berkshires. So we take not a little pride in being off the beaten path.